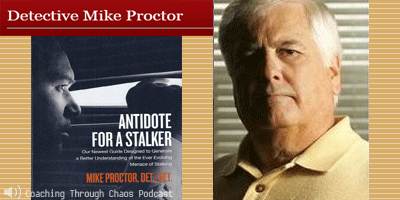 Dr. Colleen Mullen speaks with retired Detective Mike Proctor, author of ‘Antidote for a Stalker‘. In this fascinating interview, you will find out about the mindset of stalkers and how to protect yourself from them. You will also hear about the evolution of the anti-stalking laws in the United States and the protection they now afford all of us. The Law is there to protect you, and Mike Proctor’s book will show you how to deal with a stalker. "Stalking is a growing concern throughout the world, not just in North America. More and more countries like the United Kingdom, Australia, and Japan are experiencing an upsurge of stalking throughout their communities. College campuses have become a breeding ground for the stalker. Workplace violence oftentimes revolves around a stalking scenario that has either evolved within the confines of the workplace, or enters into the workplace from a stalking that was initiated away from that workplace.Awareness, stricter laws, and a more focused multi-disciplinary law enforcement approach are the keys to defeating this dangerous problem. " For more information, please listen to the episode.